Sure, there are class winners and an overall winner of the race itself, which are all fine and well. 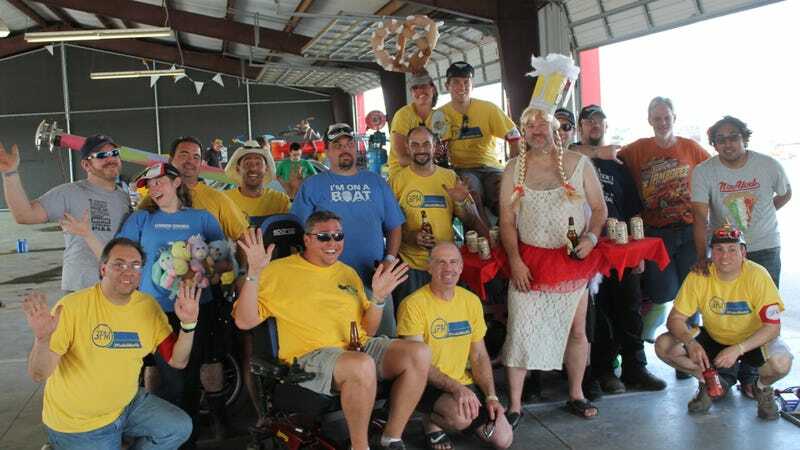 There’s also awards you don’t want like “Most Heroic Fix.” But of course, the awards you really want at a LeMons race are for the extraordinary and bizarre, and we got one of those: Organizer’s Choice. When I last mentioned how this race weekend was going, the Civic was running well, as it continued to do for the rest of the day. It picked up another black flag due to an off, but that was it. It just ran all day long with hardly any issues at all. The TR7, too, had a decent day. It stayed fairly trouble-free and out of the pits. The boat was another story. We got everything put back together, but it wouldn’t start. The starter was toast. After push-starting it, though, it fired up and another teammate pulled off a couple laps with thirty minutes of race time to go. Ultimately, though, the boat retired after those couple of laps due to the engine being a bit of a turd. The team would rather retire with a functional but sickly engine than one that blew trying to make it to the checkered flag. That makes any future use of the boat a lot easier to pull off. Despite the technical difficulties, the team took home a sweet trophy: Organizer’s Choice! Our The Producers-themed screwball antics and over-the-top themeage were enough to make us the team that amused the LeMons crew the most out of anyone in the paddock. I’m a little sad I didn’t get to experience racing the boat, but I can’t say I was too disappointed in the extra bit of hardware we won for being certifiably insane all weekend. It’s LeMons. Where else do you get to quote Mel Brooks ad nauseum and roll around in pastel camo? Have fun with it, and take something unexpected on a race track. That’s the point. That’s what LeMons tends to reward the most.